So the kids convinced me to sign them up for the annual craft fair. This is the one run by the county's library organization, featuring handmade stuff by kids (not their parents) and in which everything sells for $2 or less. Very charming idea, and unfortunately one which I'd avoided like the plague in previous years because it's in the blistering August noontime sun and we're not allowed to charge what the work of the kids really deserve. I mean, there were kids who stuck a hair clip on a plastic flower and priced it $2 and there were kids who crocheted entire dishcloths and sold them for $1. Where is the justice? I'd only ever done one craft fair in my whole life and I quickly decided that, much as I love mass-producing, sitting at a table covered with nondescript fabric items (what I sold) was not my calling in life. Give me a classroom of sewing newbies who don't know the difference between a seam and a selvedge any day! But then, there was the idea of education.... not me teaching people to sew, but the kids learning how to run a business, that sneakily appealed to me. So I said to them, "Okay. It will be a good experience for you girls. Yes- even you, little Kate." What to sell, though? That 4-year-olds could make, without overcrafty parents helping? I could think of a gazillion things to sell that were unique, crazy inventive and totally hip and made of cardboard. But for $2 or less? Opportunity costs aside, I couldn't bring myself to show such little respect for so supreme a crafting material. 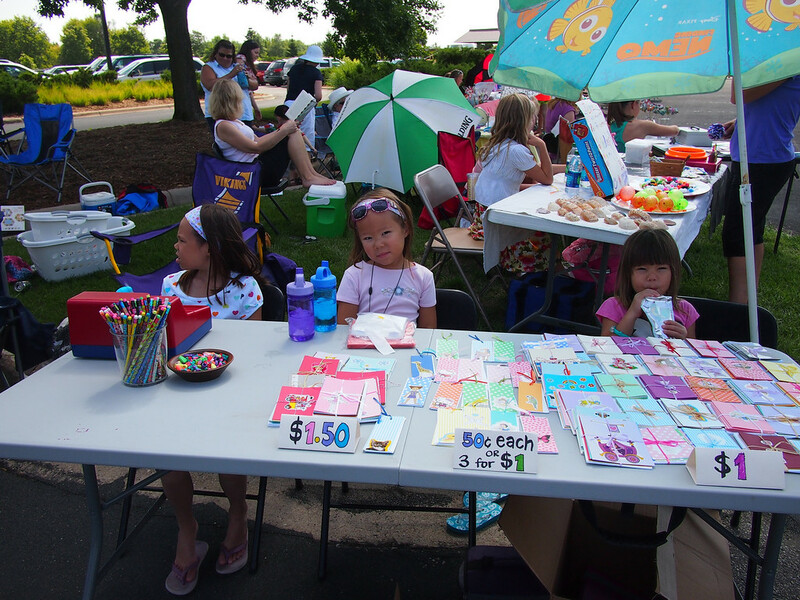 The girls then suggested selling our vast collection of card sets that we'd made earlier in the winter. Perfect. Not unique by any stretch of the imagination and clearly a gross under-representation of the never-say-normal capabilities of my kids but they made them all by themselves and they were gorgeous. Plus, and most importantly, they were already done so no extra work for me, meaning I could continue enjoying my summer with no interruption. In other words, I could keep on swimming (hurrah)! So the girls were set to work thinking up a business plan, including pricing, marketing, publicity and communication. I'd never studied Economics at school so I simply did this the common sense way. 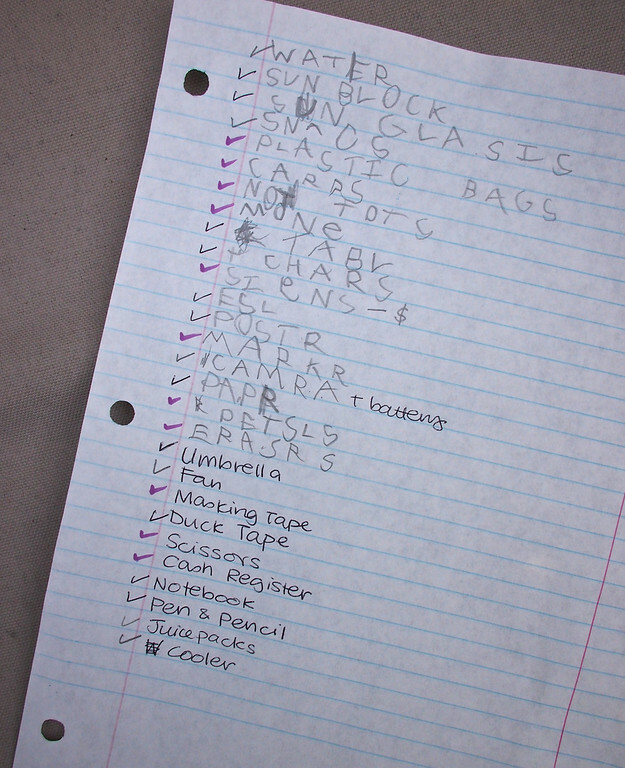 Jenna made a list of the things we needed to survive an afternoon under the scorching sun. Emily did market research ("we need kitty and puppy stickers because that's what I see a lot being sold in stores so it means people must like them!"). 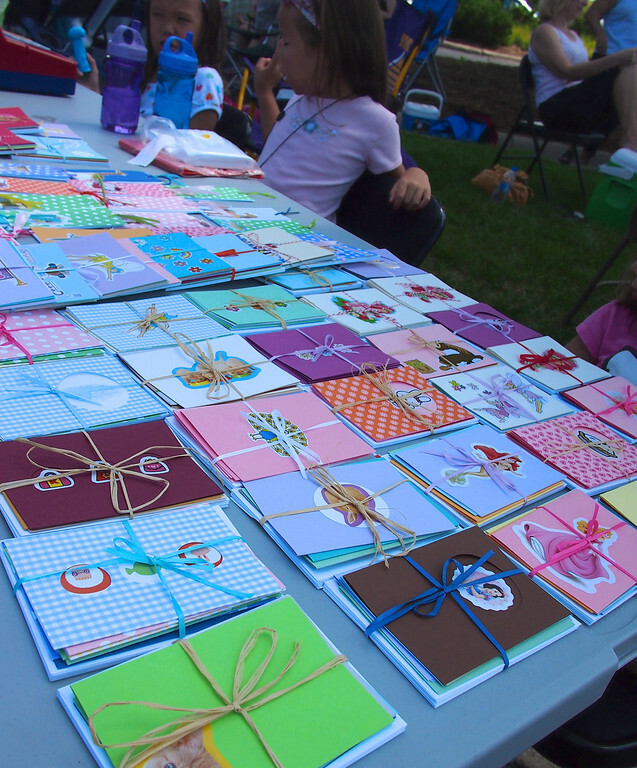 Everyone worked on developing a secondary line (little notebooks that used up the remnant cardstock). 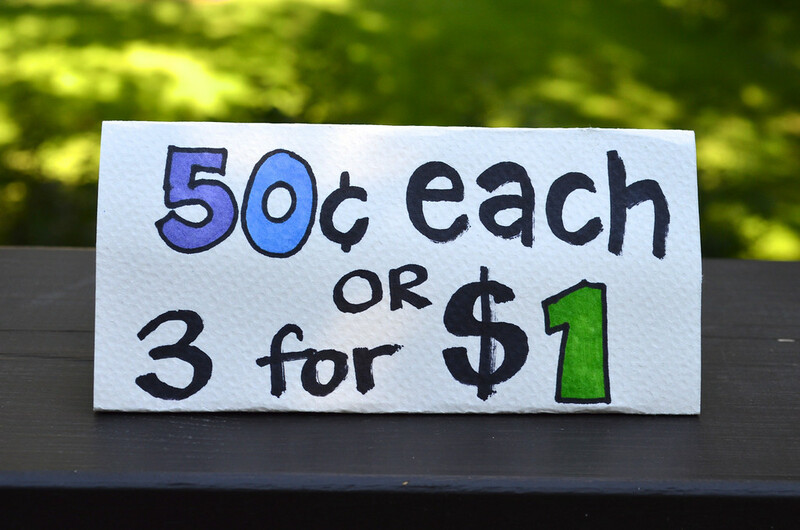 and discussed the rationale of price scales ("card sets with 5 or 6 cards should cost less than card sets with 8 cards"). We set out little plastic bags ("because all stores have them to carry home stuff in"). We talked about how to get small change for monetary transactions and how many quarters there are in a dollar. We designed and drew up signs. We emailed friends and invited them to come browse. And we managed expectations. Oh, this part was soooooo important. The girls are so used to watching things fly out of my etsy shop now that they forget how slow sales were when I first opened it three years ago. And they don't know the crazy hard work that goes on behind the scenes to build a reputation and a market of potentially-interested buyers. Or getting featured in magazines and books to get one's name "out there". Or learning how to take half-decent photos that might possibly do justice to products that one has already spent hours making. Or driving to the post office in all kinds of weather, with small children, some still in rear-facing car seats. And filling out tax forms. And logging transactions and expenses and other inane numbers in pages and pages of spreadsheets (and forgetting to click "save" when one is done). Been there. And I'm soooooooooo still there. And so we said to each other, "The fun is in the preparation, right? Are you excited? Who will help me plan the poster? What sort of jobs do you think we'll have on the day itself? Shall we take turns bagging items? Let's practise what to say to people who ask us questions! If we sell just one thing, it will be a bonus! Look at what you now know about running a real shop! I'm so proud of you! It's only four days away!" After my first look at what was on the vendors' tables - including ours - I marveled at how different they were from what I'd been seeing on craft blogs. I mean, I was looking at real, regular people who made stuff like duck tape pencil toppers, Perler Bead coasters and the aforementioned plastic-flowers-glued-on-hair-clips. Perfectly artistic but not the sort of projects that were likely to end up on my pinterest boards. And therefore completely refreshing in their normalness. I loved it. 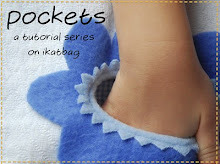 I think that sometimes, crafty blogland is heinously insular in how it makes us think every other person is some crafting maven (also how it makes us pin, pin, pin - as if we're ourselves desperately boring and uninspired people). And, for what it's worth, I apologize to anyone who thinks that of our family because of what they see on this silly blog. Yes, I have the bad habit of being slightly freakish with cardboard but on more days than not, all that my kids do is color on printer paper with Crayola markers and play with plastic toys. Why do you think I don't post every day? Or that I talk more about procrastinating and swimming than actually accomplishing? We earned a whopping $5.50 today. Jenna, to her disappointment, didn't get to provide a plastic bag to a single customer (except our friend, who graciously accepted one) but she kept a tally in her notebook of what we'd sold. Emily, after a hesitant start, opened up and started talking to customers. Kate sat under our big umbrella and ate string cheese, apples and drank copious amounts of juice. We gave her an award for All Time Patience And Cheerful Participation While Fighting Dehydration. The girls' favorite part of the Fair was probably the last 15 minutes, when we were allowed to barter with other vendors and trade wares. 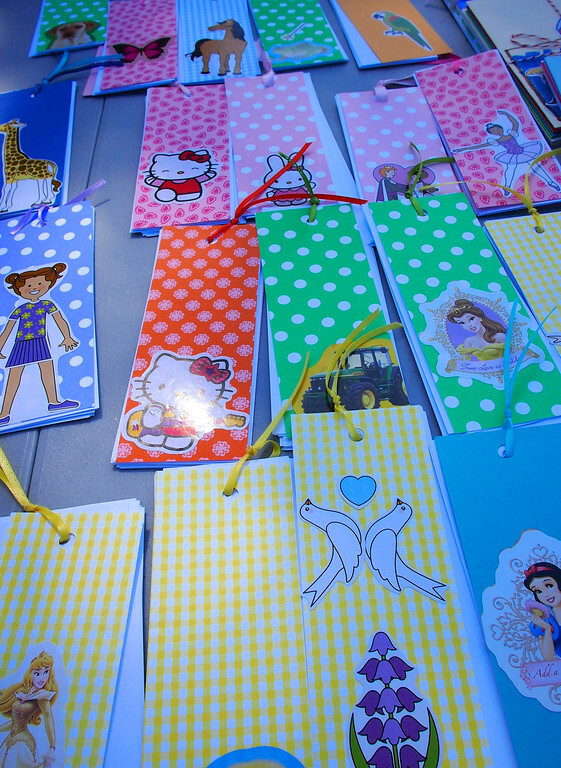 The girls ran off with sets of cards and swopped them for hairclips, bracelets, notebooks and toys. And they got to negotiate with people who came over to our table to trade with us. And then we packed up and went out for a late lunch of burgers and fries. Yum. Emily said, "Can we do this again next year?" Ummmm. We'll see. The kids learned a lot about Supply this year but absolutely nothing about Demand. Perhaps that will be next year's lesson: to develop an awesome product. Maybe we'll even break out the cardboard and raise the stakes a little - you think? None of the vendors made anything out of cardboard this year - can you believe it? None! For shame, people of the world (including lazy me)! Or make silkscreened superhero capes. Or clothespeg rubber band crossbows. Or wooden donuts. Or cardboard easels. No - wait, those are my ideas. I need to hand the helm over to my littles. They can do - and have already done -amazing things. So that was our first Kids' Craft Fair experience. A good day - especially for the the Teacher in me, if not the Mother as well. Have you ever done one? What did you sell? What do you think we should we sell next year (if)? Gosh, I love your teaching attitude. What a great experience of the girls. I've had a horrible time at craft fairs myself, and I think you did an excellent job preparing your kids. This makes me think, just how awesome it is for our kids to see us moms doing work from our homes. How lucky for them to learn lessons about entrepreneur-ing in this way. I would pay $40 or more for one of your chickens and a few chick stuffed eggs at a craft show. Just sayin'. :)PS your girl's papercrafts are adorable and I would have bought something for everyone I know! wow! what an amazing experience! your kids are doing a much better job in business than I am - my "planning to sell at the craft fair" never materializes. maybe next year they'll consider offering a service instead: business consulting. When we made Crafts, we hired our daughters to work for us. to also stuff dolls after school. Our girls, to this day, were inspired by those older girls. 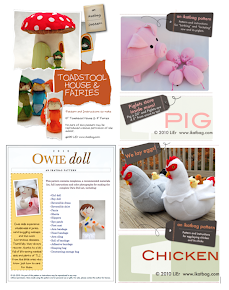 We sold the dolls at Retail Buyer Shows, twice a year. The Retail Buyer Show orders were filled, and we spent the rest of the year filling re-orders. We were at home to raise the kids. They were never kept by a baby-sitter. The Craft Business paid the rent, utilities, food, clothing, and health insurance, as well as all the car related stuff, like gas, insurance, repairs, and so forth. All the materials for making the dolls were also a part of the business expense. When hiring part-time employees, you become a small-business, and must pay extras, such as worker's compensation, and so forth. As a small business, you become a non-paid tax-collector for the government, and must collect Social Security as well as withholding taxes, and so forth. So not only must you be creative, and come up with new designs twice a year (that, if good, are copied by mass-producers, overseas, and sold at half-price at the next show), but you must also be a Marketer, Promoter, Distributor, Advertiser, and so forth, all at your own expense. Anyway, as we passed a Lemonade Stand the other day, out on a country road, I mentioned that the girls at the stand would be very lucky to make enough money to pay for the sugar in the lemonade, much less the cost of the lemons, and certainly would not be expected to make a minimum wage for their time, if any wage at all. In all the years of sitting at booths at various Craft Fairs, and Retail Buyer Shows, I cannot think of any other time that I was more bored, and wished that I was doing something, anything, else. The only redeeming thing was that there were, sometimes, some interesting people in other booths, or even the occasional interesting buyer, or onlooker. Otherwise, for the most part, there is no glamour in running a Crafts business at all. You must enjoy working alone for the most part. You must enjoy doing the same thing over and over again, and making it look as if you are having the greatest time of your life doing it. Each piece must look like the piece you sold at the booth, or better. Does that get old quick? Think about doing hundreds or thousands of them. That is how you pay all the bills. That is how you live. There is no other support. There is no spouse with the paycheck to fill-in. Make sure they understand all that stuff too... in due course. Mathematics is the filter that society uses to separate the high earning tech-savvy people from the flippin-burgers people. Make sure they understand that too !!! Part of that question is to see if the kids are interested in doing this again once July 2013 rolls around. 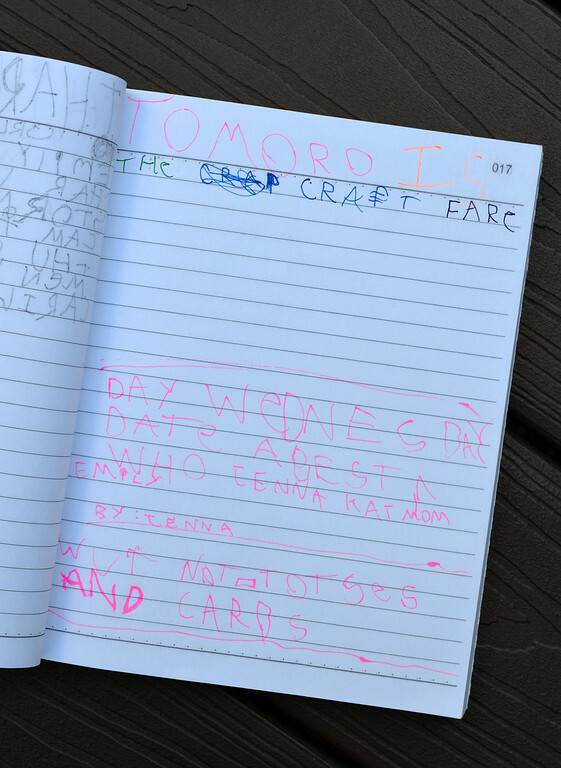 You sound like you already do an awesome job of letting your kids craft - instead of them just copying you. The kids will lead you. next up - county fair entries. My nephews in St. Paul enter their stuff. My 8 yr old nephew entered his creation utilizing dryer lint. Turns out there is huge interest in dryer lint art and he is trending. Kathy, I'm so intrigued! I have a 2yo whom I know has a future in dryer lint art (whatever it may be). I'd like to prepare now to exploit that. Wow, that's a really great idea! I'm not a craft show person myself (tried 2x and just don't like it), but teaching your kids about the biz, that's a cool idea. ¡Qué bonitos cuadernos y lápices! Oh, you definitely should do it again! I suggest thinking up something amazing during the winter months when there isn't much else to do. My kids have attempted to sell their old clothes and toys in our driveway on a table, but our neighbours are almost exclusively little old widows and are therefore not much interested in a size 7/8 skirt. I enjoyed this post. 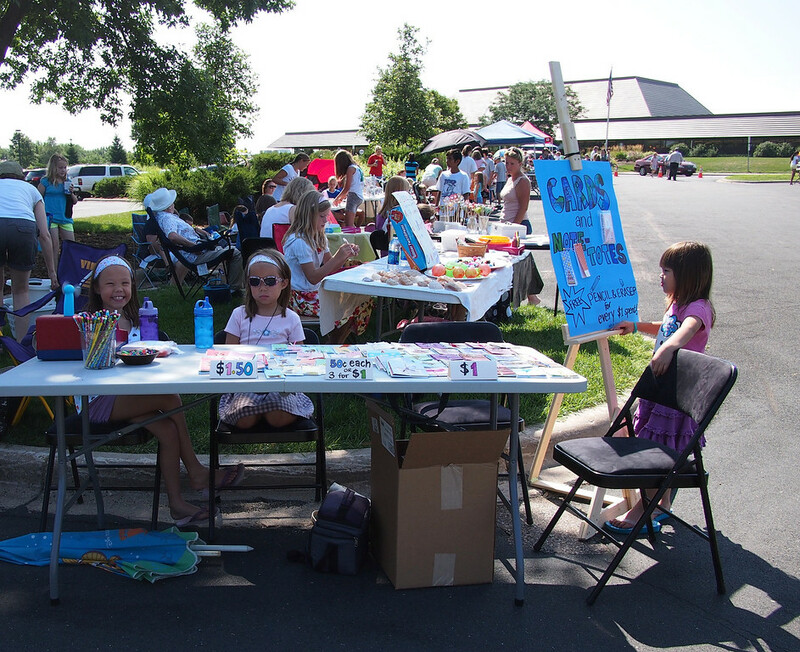 Our little town is encouraging 'Entrepreneur'days, starting in grade 3, then grade 6, then grade 10. 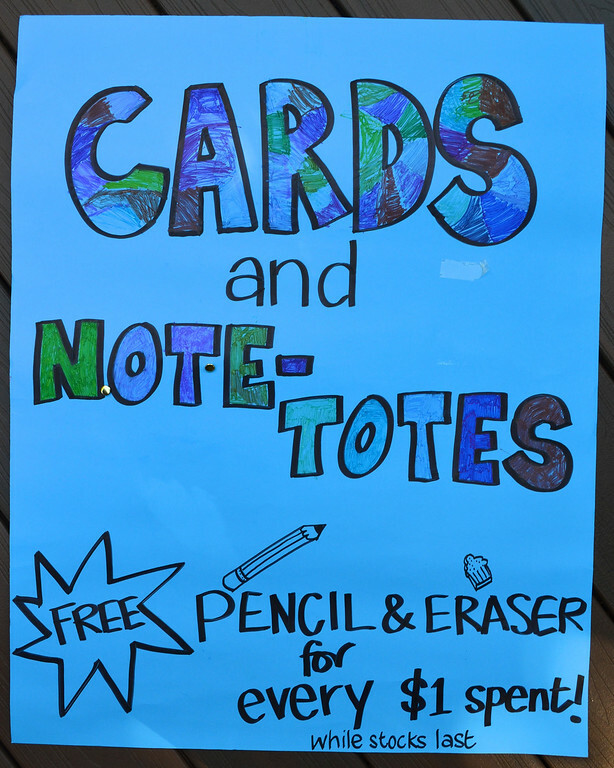 They each have a scheduled day in the school year to run a little market for school mates. Then the town has an annual craft market open to all, where there is usually one kid's group organised or brave enough to join in. I'm trying to steer my girls' club in that direction, this is realistically inspiring! Oh this all lokks very familiar. My eldest teen recently did her first craft fayre, and although she's much older than your girls, we went through a lot of the same processes, especially the managing expectations thing. 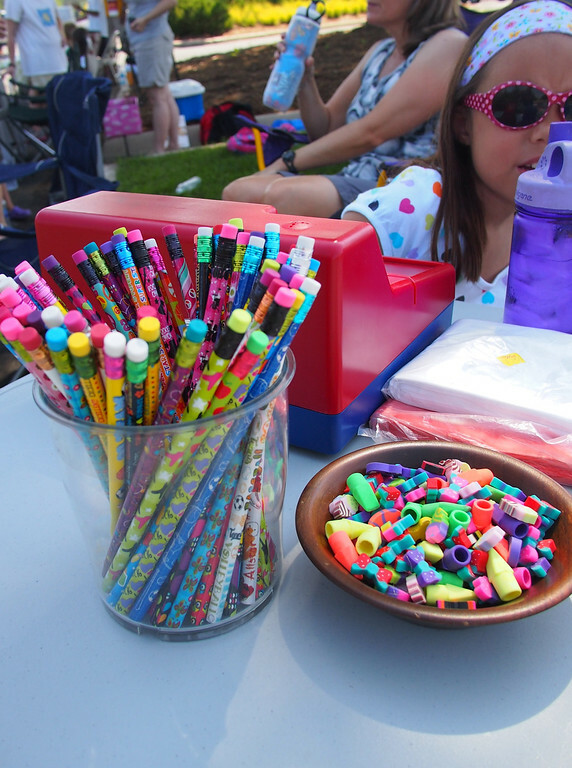 I love the idea of a kid's craft fair. I have never seen it done before. I have done some craft shows over the years and it really isn't my thing. My kids however would LOVE it. It is a great lesson in business and patience:) Does the library charge for the table or is it free? I think I may try to organize one of these in the future. Thanks for this post. Have a great weekend. Jess- it's free but you need to bring your own table and chairs and shade. We had over 40 stalls this year. It runs for 2 hours, from 11 am to 1 pm (worst time of the day because of the heat, actually). We just need to register so they can call us and tell us the relevant info for the day itself. Good for your son (and his friends)! Re: continuing - it looks like it'll be more about whether I'm willing to do this for a second year than the girls being interested. Hopefully they'll forget about it by next summer! I mean, I can think of many, many better ways to learn about commerce than sweating it out at a craft fair. And, honestly, there's the age thing: I feel they'll do better overall (selling and learning) when they're in their teens/tweens than now when some of them are still in preschool! Their crafting skills will be better, for one, as will their repertoire of ideas for projects and uses for the same materials. So let's hope they'll be willing to wait a few years before doing this again. I can almost guarantee more interesting results for everyone all round by then! LT: We hadn't planned to, but if you'd like, I could send you a picture of what we do have left (after the bartering at the Fair) and let you know the shipping as well. Which country are you in, by the way? If you see something you like, I can set up a reserved listing for you in the shop. The kids will be thrilled! Shoot me an email so I can mail you back a photo and shipping info, OK? No obligation to buy - you can decide if you're still interested then. your children will have MBAs before they're legally allowed to dirnk or drive! Showed your comments re 48 yo terrorist to my ex-husband- he thinks you rock too! Maybe I'll get brave and open an etsy shop, someday. For now I'll let myself stay busy with my blog therapy and looking after my littles, including the baby due three days ago who will hopefully show up soon. 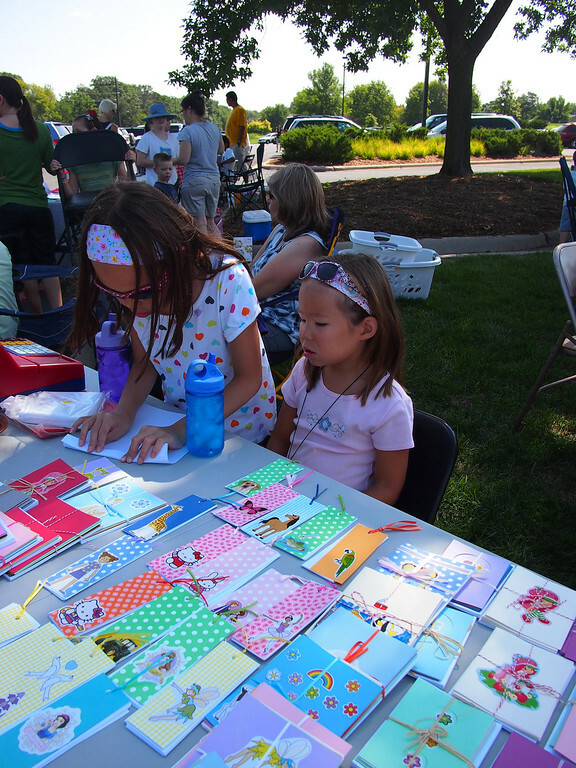 I love that your girls could participate in a KID craft fair! Emma would adore that - and it would provide some focus for her seemingly endless crafting energy. I especially like the barter option at the end! I think it is so valuable for kids to know how to make money. It will help them so much later in life. I looked every where and found a kids business plan at http://www.truesmarts.com, under advanced kids business. If your interested . . I found it really useful to teach kids how to choose plan and execute a business.